Tom’s Note: this is a guest post from Matthew Turner, the indomitable author of The Successful Mistake. I don’t normally take guest posts, but Matthew’s article hit a nerve with me as I’ve dealt with a lot of failure in my life. If you’ve ever felt like quitting when things get tough, this article is for you. Read this. Bookmark the page. And then share with people you know. As I looked at the screen, I knew I wouldn’t make it. I realised my book crowdfunding campaign would fall short. They say you shouldn’t take business personally, but I did. This book is my baby, and I put a lot of work into this campaign. I wasn’t one of these people who woke up one morning and decided to crowdfund my book. I meticulously outlined and perfected my plan, and I did everything I was supposed to do, so why me? Where did I go wrong… ? That’s what I hope to share with you in this post, and it’s why I turned to Tom, because he succeeded with his crowdfunding campaign, and he’s someone I turned to during my own book crowdfunding Project. If you have a crowdfunding campaign on the horizon, I’m sure you’re devouring Tom’s content as well. And indeed you should. But it’s also important you see the other side of the coin: what failure looks like so that you can avoid the same mistakes I made. I don’t have all the answers, but I’m able to look back and appreciate the mistakes I’ve made. Hopefully, my own experiences will fill in a few gaps for you and help you find that slight edge that can push your crowdfunding campaign (or any project) to the finish line, successfully. THE SUCCESSFUL MISTAKE CAMPAIGN – WHAT WENT WRONG? Crowdfunding is fast becoming one of the mot popular ways to fund and validate a project. Not just with books, but every conceivable product, service, and business you can think of. It’s fantastic, and, done correctly, you cannot fail. For instance, The Successful Mistake crowdfunding campaign failed, but the project itself is not a failure. I continue to write the book. I’ll still publish it. I’ve learned a lot, and along the way found new readers and partners. But it’s important you appreciate the obstacles and hardships – because if you didn’t already know, crowdfunding takes time, energy, and commitment. In fact, on a site like Kickstarter, 60% of projects fail. The odds are stacked against you, but when are they not? Most authors sell fewer than 100 copies of a single book in a year. It doesn’t mean you won’t, but if you do fall short, it doesn’t make you a failure. So before we get into HOW not to fail during your next project, let’s go over what did and didn’t work during The Successful Mistake book crowdfunding campaign. 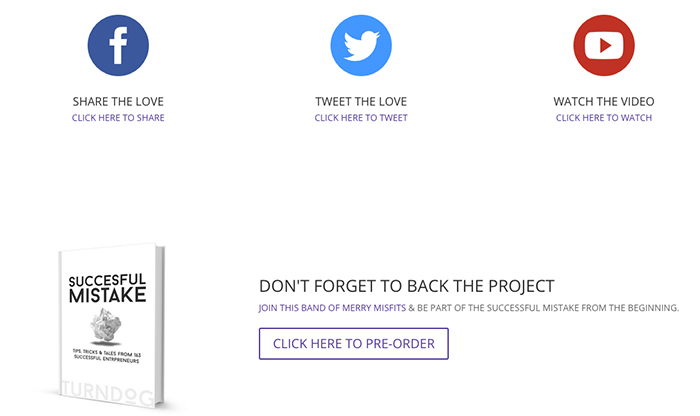 The homepage of The Successful Mistake crowdfunding campaign. The Share The Love Page I created, making it easier for people to share… well… the love. Behind the stats… who bought what, and the value of each reward tier. 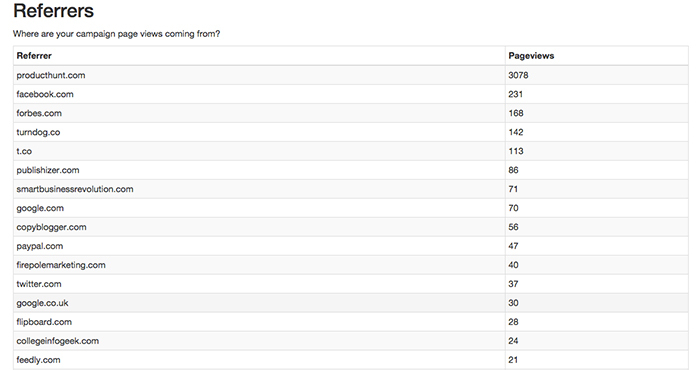 It’s always interesting to see which sites direct the most attention to your campaign. The Successful Mistake appeared on Producthunt.com = lots of traffic, little conversion. Good traffic from Forbes, and several sales in the 24 hours that followed this publication. Clay Hebert says the difference between a successful and unsuccessful crowdfunding campaign boils down to two aspects: Traffic & Conversion. If you compare the total number of social shares I received (160) to successful Publishizer campaigns like Jeremiah Gardner’s (1,100), Mr. Tom Morkes (324), and Ryan Hanley’s (632), it’s easy to see why I never built momentum. It isn’t solely about the number of shares, because conversion matters, too, but your first step is to find them. The fundamental reason The Successful Mistake crowdfunding campaign failed is lack of traffic. There must have been a reason, so let’s spend the rest of this post delving into WHY they didn’t, WHAT I did wrong, and HOW you can ensure you don’t make the same mistakes. Not everything went wrong during this campaign. Overall, feedback remained positive regarding the Cover Design, the Book’s Premise, and the Publishizer Page layout. Appearing on Product Hunt and Forbes brought decent traffic, and although conversion remained small, I sense it was down to a lack of momentum rather than design or optimisation. Your opening few days are vital because if you fund 25% within the first 5 days, you’re 5x more likely to surpass your total. Tom’s Note: I’ve read similar statistics from Kickstarter that a project that hits 30% funding has a 90% chance or greater of funding…although my feeling is that momentum / velocity is a key indicator of success, which is why the first few days are so important. This means your early adopters are an imperative piece of the puzzle (whether that means your family, mailing list, 163 entrepreneurs who you feature in the book, etc. ), because if they drive enough early traffic, they remove the barriers that keep strangers on the fence further down the line. Which means all the decent press I received towards the middle and end of the campaign was pointless because I messed up during those first few days. The Successful Mistake crowdfunding campaign launched in February 2015. Email 1: 6th January = A recap email overviewing my plans and when the campaign would launch. Email 2:11th January = A Video Email – a personal recording for each person. Email 3:16th January = A Thunderclap themed email aimed at gathering social shares. 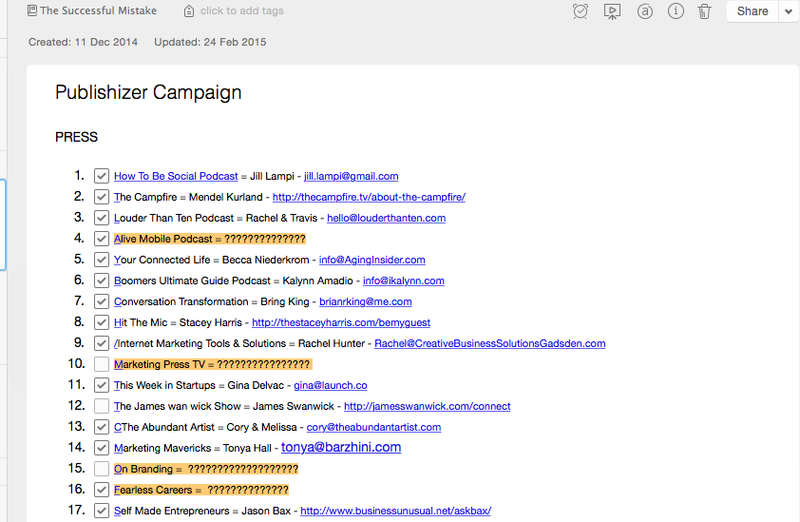 Email 4:22nd January = A Podcast themed email announcing its launch. Email 5: 2nd February = A Launch Day email sharing the project page. 5 emails within a short timeframe, and this is something I tossed-and-turned over. Trust me, I spent the holiday season going back and forth. I didn’t want to annoy people, but I also knew I had to start this campaign in style. You can see the emails I sent Tom Here: Email 1 I Email 2 I Email 3 I Email 4 I Email 5 and for the most part I kept them short and sweet. I’ll be honest with you, something didn’t sit right with me during this period, and I ultimately gave into my fear and pushed too hard. But they say you need to hustle and do what you need to do, so I kept true to my plan despite feeling icky. Instead of cramming 5 emails within a few weeks, I should have started this process much earlier. In an ideal world, I’d have done this six months before launch, which shows how dangerous rushing your campaign is. Rather than send your typical written email, I encourage you to consider a Video Email, too, for these were the messages that brought the most replies… conversations… and overall good times. Instead of sending a swarm of messages mere weeks before launch, I should have sent Tom (and everyone else) a message like this in November. A pre-Christmas video like this would have solved all these issues, because I’m reaching out to say hello and to offer a helping hand/support. I have nothing to sell. I have no favour to ask. It’s a genuine and meaningful message, and it’s sole purpose is to start a conversation. I’m no longer that guy who gets in touch only when he needs help. Email 3: 2nd February 2015 = A launch day email that links to the campaign and asks them to share the love (refusing the temptation to ask them to pledge/buy) I know this sounds time-intense, but it isn’t. When I sent all 163 video emails in January, it only took me one hour each morning for five consecutive days. Tom’s Note: I completely agree with this strategy. The key is starting WAY before you need anything – months or years in advance. I can say of what success I’ve personally had is due 100% to helping others first long in advance of asking anything in return. Then, when the time came, I didn’t hesitate. Yes, it takes time and effort to do this – and many people will take you up on your offer to help, so don’t over promise what you can’t deliver – but it’s worth it in the long run. I’ve added a video below that demos how you can do this for FREE and in a matter of minutes. The point is to use these three emails to start conversations instead of asking for favors. If you wish to do this by written form, do so. If you prefer to write letters or jump on Skype, fine. The point is to lay your foundations well in advance, offer a helping-hand, and refuse the urge to ask for anything in return. These pre-launch emails serve a single purpose: SPARK A CONVERSATION!! With this you’ll learn more about the other person, they’ll learn more about you, and as launch day ticks closer you’re in a genuine position to ask for help. For reference, here’s a video email demo. Although the press I received (Forbes, Product Hunt, Copyblogger) didn’t bring the conversion I’d have liked, it did boost traffic and introduced the book to lots of new people. This is fantastic, but it comes back to the role your early adopters play, because why would a stranger pledge towards a project that’s only 20% funded with a few days to go? There are too many reasons to say no, which is why those first few days are oh-so important. If you remember what Clay Hebert says, it’s about Traffic & Conversion. Good press brings good traffic, but conversation only comes if your early adopters lay down the gauntlet. Tom’s Note: I think relevant traffic is key. I’ve done quite a lot of guest posting. Some for very big sites. I’ve even been mentioned / featured on sites with million+ readers per month (true story). Guess what drives the most consistent traffic, with the highest conversion (in my case, conversion means signing up for The Resistance Broadcast)? Not the big name websites you’d think…it’s the small, niche websites with ENGAGED audiences that always lead to the best traffic and conversion (and, subsequently, best new fans and supporters of my work – woohoo!). The point I’m trying to make: think about who you’re targeting. Don’t focus on big name websites or whatever, focus on relevant niche blogs / podcasts with engaged audiences…I promise, it makes a big difference. As such, it’s important to get relevant press for your campaign, but ideally not in the first few days. You want all that juicy new traffic after your snowball’s gathered speed, but we’ll come back to this soon. I believe the time I spent researching who to target and where to appear was worth my while, and the way I created specific topics/articles/ideas for each was, too. However, if we look at how I appeared in Product Hunt, Forbes, and Copyblogger, it was via an introduction. 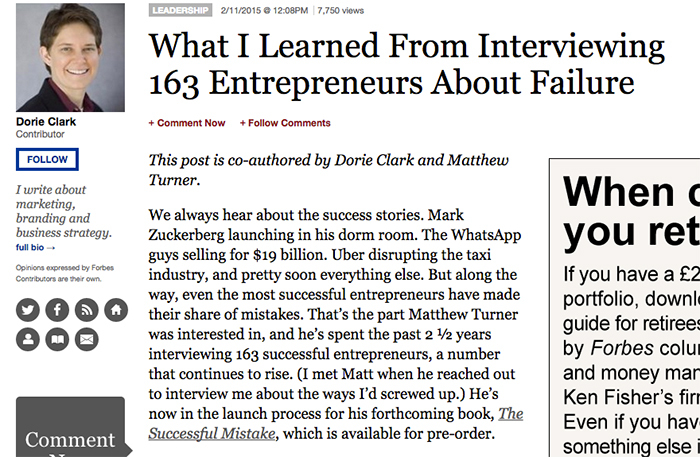 Dorie Clark co-wrote the Forbes article with me. Brian Gardner introduced me to the editors at Copyblogger. Paul Kemp helped me get on to Product Hunt and reach lots of like-minded individuals.  Creating a list of relevant and high-traffic websites, publications, and podcasts? Good! Outlining specific articles, ideas, and topics? Awesome! Emailing them and following-up and hoping for the best? Not so much!! This is where my network of 160+ inspiring entrepreneurs could have helped, because many of them write for sites like Inc, Entrepreneur, The Huffington Post, et al… A vast majority know podcasters and journalists and folk with popular sites, and had I started a conversation with them and asked for specific help further down the line… boom!! Like I said, there wasn’t much wrong with my planning. I encourage you to plan and research the most relevant sites and publications for YOU. I used tools like Buzzsumo and Alltop to hone in on the places that attract my audience, and from there you can craft specific ideas based on their style and guidelines. You don’t need to create a huge list either, because you only have so much time to write guest posts and jump on Skype. It isn’t about appearing everywhere, rather the right places that offer the most bang for your buck. Once you narrow this list down, it’s a question of: Who can connect me with the right people? Where have your friends written/guest posted in the past? Who are they connected to on Facebook and Linkedin? Do they have a Blog/Podcast themselves? If they could introduce you to three people, who would they be? I had 163 people invested in my book, most of whom could introduce me to somebody relevant. I’m not saying you should reach out to people with an ulterior motive in mind, but it’s okay to ask for help so long as you go about it in a respectful manner. This is why starting a conversation is important, because you take the time to warm up before you call in the favours. It’s also a fantastic time to check who those you know, know. Are they friends with a journalist that writes for a publication you’ve targeted? Have they guest posted on a blog you love? Who are they connected to on Twitter, Linkedin, and Facebook? Hi Tom, hope all is well. How’s the first draft of Collaborate coming along? Let me know if I can help at all. Just a quick favour, because I know you’re friends with Dan Norris. I believe The Successful Mistakee and 7 Day Startup share a common audience, and I’ve one or two ideas I think would be a good fit for his Blog/Newsletter. Would you be able to introduce me to him? Hoping to have a quick Skype Chat and share my ideas. I received excellent traffic through a few vital introductions, but I didn’t place enough focus on this, instead hoping those I know would introduce me to their own communities. Poor Form! Tom’s Note: I’ll recommend doing one even better. Keep it short and sweet like above, but also have a quick 3rd person intro for yourself, something the relevant party (me, in this case) can copy and paste and send to the person you want an intro from. This makes my job even easier, and because I’m incredibly lazy, it’s more likely going to happen in a timely manner. Assume most people are almost as lazy as I am, and you’ll have a better chance of getting an introduction. I assumed those who feature in the book were my early adopters. They will help, but don’t place all your eggs in their basket. I know this may sound simple, but your true early adopters – those who set your snowball in motion – are those who are part of YOUR community (aka: your mailing list, Facebook group, etc…). I knew this, so why didn’t I place more emphasis on these people? This is fine most of the time, but when it comes to a big campaign these people are your soldiers. These amazing individuals are the ones you lean on, and because they voluntarily follow you (and because you provide massive value 90% of the time), they help you build momentum. Here are a few examples of the emails I sent to my mailing list, and I’m sure you’ll see my fear shine through. Tom’s Note: Yeah, I’m not going to lie. This is a really difficult email to read. It should have been about 5% of the size and gotten to the point (i.e. what I care about as a reader, not the author’s story. Take notes here – longer is almost never better. Happy Monday morning to you,EEEKKKKKKK the big day has arrived, and my tummy rocks and rolls and twists and turns. This isn’t my first big launch day. It won’t be the last. Something about it feels special though, like it possesses a defining quality that could determine my future. After all, The Successful mistake isn’t any old book, but one I’ve spent nearly three years working on. I’ve not only interviewed 160+ successful entrepreneurs, but formed connections and friendships with them. It’s more than a book, because it’s offered as much wisdom as a business school could. I’ve no idea whether other people will love this, but I do. It’s changed my life, and because of this, I wish to do it justice! It’s why I’m so damn nervous. I’ll keep this email short, because who has time for a long Monday morning read? You’ve listened to me whittle on about this book for months, so you know whether it’s a good fit or not. It won’t take long to peek at the limited edition rewards and decide whether you want them. You know your friends, and if this is the type of book they’d like to read. If it is, share it with them. If not, no bother. That’s all there is to it. Thank you for being you, and for reading, and supporting, and being here. I appreciate you, whether this book is a good for for you or not. I hope you have a fantastic start to your week, and I hope you’ll hit reply and tell me all about it. I didn’t do any of this, instead focussing my attention on The Successful Mistake launch period. This period is important as we’ve already discussed, because Press/Media drives vital traffic. But none of it matters unless you build your early momentum, and considering your tribe drives this, it makes sense you build it beforehand. 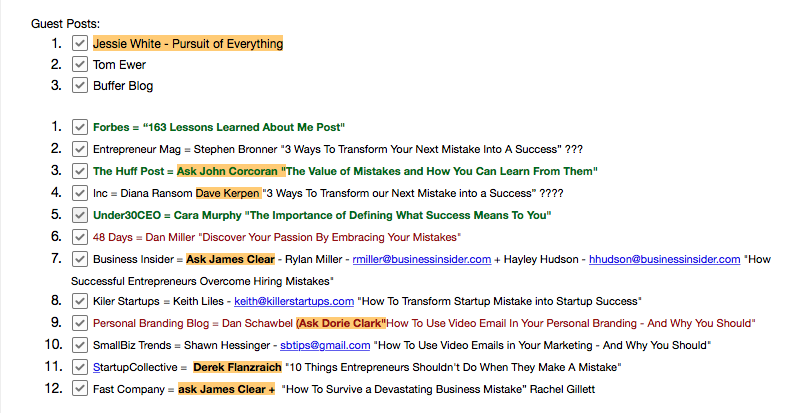 WEBINAR PARTNERS = This is something I’m currently doing, and it’s helped build my email list. The key is not to run webinars on your own, instead collaborate/partner with another business/individual. Consider the brands who already help your audience, and think of ways you can provide added value in the form of a Webinar. They already have a community of people you desire to reach, and this is a fantastic way to reach them. GUEST POSTS = In the same vein as above, connect with those who already reach your audience through a blog, newsletter, or forum. Something I’m currently doing is writing a Guest Post for those I partner on a Webinar with. Not only does this advertise the webinar, it connects you with their community twice – in two separate, but highly relevant channels. FACEBOOK ADS = Online advertising is a huge game, but I sense Facebook would have brought me the biggest return. However big your budget, Facebook provides an affordable means to reach a specific and relevant audience. A perfect place to build pre-launch momentum. Of course, this is a balancing act. Writing guest posts and preparing a webinar takes time, and this comes whilst you touch base with your friends via a video email – Let alone the actual campaign you’re preparing for. As such, don’t overcommit yourself. Saying this, I could have easily written a handful of guest posts and partnered with a few brands on webinars. Targeted properly, this could have added hundreds, if not thousands to my mailing list at a time when all eyes were on a single Successful Mistake prize. There are numerous ways you can provide value via a content upgrade, but make sure each Guest Post, Interview, Webinar, and Facebook Ad points to the same gift. You can create a separate landing page for each one, and bespoke it slightly for different audiences, but be sure to give all these new people a common product. Why? Because these are the most relevant people in your community. They may be new, but they came across you whilst you spoke about your upcoming campaign. They’re ready and primed to set your snowball in motion, so make the most of it. If you’ve made it to the end of this post, congratulations. I wanted to open up the complete process and provide you the keys to the castle. This is what I did, where I think I went wrong, and what I’d do if I could jump in a time-machine. I want you to succeed, and hopefully my words help you find that extra 10% of success. But please-please-please don’t see my campaign as a complete and utter failure. I made mistakes, fell short of my goal, and let myself down, but I didn’t fail. I learned a lot from this campaign, and whatever happens with your project you’ll learn a lot, too. If it falls short, so be it. But then pick yourself up and learn, push forward, build your platform, and make it happen. You only fail if you give up, which, of course, you won’t do now that you know what mistakes to avoid (at least I hope not). If you do happen to have any further questions, add them to the comments below. I’m excited to connect with you and learn more about your future campaigns and projects. Matthew “Turndog” Turner is an author, Brand Storyteller & Speaker who spends each day Discovering, Creating & Sharing Inspiring Stories. His upcoming book is THE SUCCESSFUL MISTAKE: a story about overcoming your #GreatMistake and transforming it into your best idea yet – featuring many of your favourite entrepreneurs. Thanks for sharing this post…as a rabid fan I quickly read it because I knew the advice included would be very valuable (proving some of the points in the post!!). There are many things that make us stop in the middle of shipping…and most of it leads right back to our fear of failure. With my clients, I ask them if they are also afraid of success – undermining their own work because if they are successful they have raised the bar and need to live up to a new set of expectations, new client needs and more. This is a push beyond their comfort zone. This is a bravely written post in the name of sharing and helping others move beyond. I have taken notes and added 6 new points to my plan – most relevant to my situation – reaching out to my current audience to start providing help now. Hi Lora, thank you so much for your words. And I like your take on success, too. Fear of failure is huge, but fear of success can be as well. Like you say, success takes us out of our comfort zone, so it truly is a rocky adventure in its own right. Hi Matthew, hi Tom, thank you both for sharing. Kind of wow, oh gosh. I am almost right into the middle of my crowdfunding campaign and I feel I can check most of the mistakes you talked about. And this is not my first crowdfunding campaign. I thought my main community, the would-be-early-adopters, were going to be the ones that backed the former campaign, plus the people who purchased the product later on or was gifted with it, the vast majority of whom said they were so delighted with it, and asked whether would there be a 2015 edition? We are going to miss it! So well.. Both campaigns were aimed to crowfund a cosmic calendar, the StoryStellArt. 2016 edition is more complete, more beautiful, more… more. It’s also a different product, because it’s a different year. I got at least 140 prior backers / product lovers in the specific email list. So… why did I lack momentum? – nobody is thinking about a 2016 calendar at the beginnings of summer. No matter how beautiful, different, or how lovely people think it is. They will purchase it later on in the year. No need to hurry, six months to go. Bad timing then. Here’s the link to the campaign (20 days to go on Tuesday), in case you want to check it out: http://vkm.is/storystellart2016. Both English and Spanish. In the meantime I’m gonna keep on working in it, learning and improving. Lovely calendars, too. You have a fine skill-set. Lovely. Lovely. Yes, timing is often the key to everything. It’s hard to get in the mindset of 2016 because there’s so much life to live between now and then. But the New Year is such a hopeful time for many, that if you’re able to tap into that hope and excitement, maybe your backers will start to gather some pace. It’s hard though, but like I say in the post, and like you say, too, there’s plenty of lessons to learn, and I’m sure whatever happens with this campaign, it won’t stop you from producing those wonderful calendars. At the very least it will be big stepping stone, but with nearly 20 days to go… you have plenty of time to make it happen. Keep them coming, and if you have any questions, let me know. Happy to delve further if you have a burning issue of sorts. Dadgummit Morkes, that was long. haha, that’s how I do.